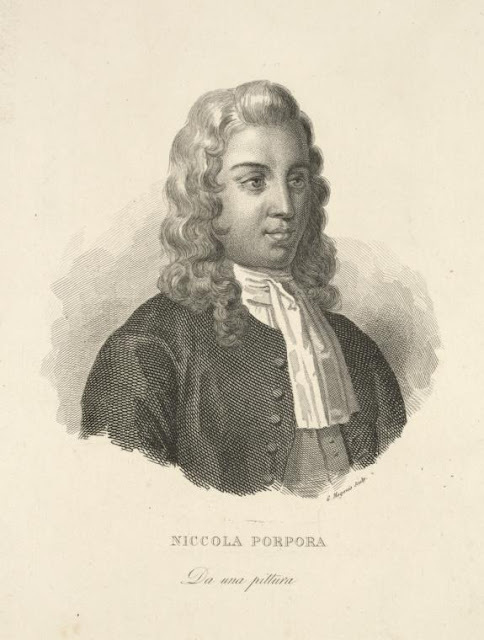 Considered the father of bel canto, Nicola Porpora taught the great castrati Farinelli and Caffarelli. He also taught Giovanni Ansani who reportedly instructed Manuel García the Elder in the precepts of the Old School. While Porpora did not record his instruction for posterity, his student Domenico Corri did, publishing something of his master's precepts in a treatise titled The Singer's Preceptor in 1810. It can be found - along with a treatise by Corri's student Issac Nathan - in The Porpora Tradition which was published in 1968 by Edward Foreman (Pro Music Press). A very hard-to-find book, I was fortunate in snagging a copy via Abebooks some years ago. Here are Corri's instructions on practice which undoubtedly reflect those of his illustrious master. The best time for practice is considered to be after breakfast, the Lungs then being in the happiest state to bear the exertion; during this progress you must abstain from an other Singing, because, for this appointed Exercise, all your power should be reserved. Did you catch the word Corri uses for breathing, that is, suspiration? It is a more sophisticated directive than the usual instruction to 'take a deep breath.' A kinesthetically oriented word, suspiration calls to mind feelings of contentment and repose. I've come across only one other place, and that is in Luigi Lablache's treatise. You have to be inspired to sing.